Megan Racing EU Euro Street Coilovers for 2002-2006 R50, R53 MINI Cooper and Cooper S, and 2005-2008 R52 MINI Convertible. Megan use to call these the EZ street, but changed the name to the EU coilovers. They are the same product just newer name. These are some of the most cost effective coilovers available for your MINI. These are similar to the standard Megan Racing coilovers with an even better price tag. 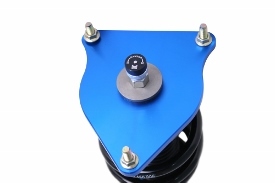 These do NOT include camber plates but do have fixed aluminum front upper strut mounts. 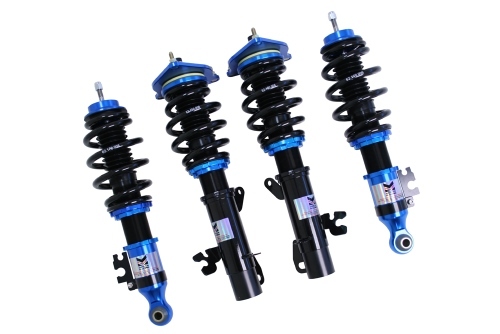 These coilovers allow for ride height adjustment and adjustable shock bodies. Come with 15 way dampening adjustment. Had these on the car for about a year now and they are great. Excellent ride on the street and enough firmness for mild track use as well. Great price for a product that also include camber plates. And as we all know, camber plates help prevent the dreaded strut tower mushrooming. If you need new struts and this is your daily driver, these are a great option.